A good furniture has the ability to enhance the entire look of a place. The material, style, color, polish and design, everything play an important role in determining the atmosphere and ambiance of a place. Every detail of a furniture affects the total appearance and appeal of a room. In the era of modern and modular furniture, Antique furniture pieces are still in huge demand. This is for a simple reason that they provide a sense of class and uniqueness. Vintage industrial furniture is the new demand of ever changing market. People find it elegant, classy and appealing in every respect. You can bring a rich and glamorous feel in your living space or in your office with antique furniture pieces. However, finding an appealing vintage furniture is not an easy task. It should be purchased only on the basis of appeal and overall elegance. There are many other factors that you should consider when making the purchase. 1. Appearance and Condition: As the name suggests, Vintage is basically antique pieces that were built years ago and are now available in limited quantity. You might get too excited while seeing an antique furniture piece and may even get carried away with this feeling. The only advice would be not to get fooled with the looks and appearance of the furniture item. It may seem classy and elegant from outside, and have broken corners and chipped pieces within. Make sure you check the quality and overall condition of the furniture piece before buying. It should not have any chipped corners and must not be suffering from woodworms. 2. Durability: If it is vintage, it is ought to be durable! Many people have this notion when buying an antique piece. This is only half correct, for a reason that not every person selling the furniture is concerned about the maintenance. Vintage furniture pieces need lots of maintenance and care. Vintage durable is usually made of solid wood, which only needs refinishing to cover up the signs of wear and tear. Furnishing can be quite expensive and will affect the entire the appearance of the furniture itself. As far as material is concerned, it is advisable to choose furniture which is made of solid material. 3. 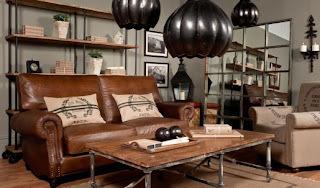 Functionality: This should be the major consideration while buying a vintage industrial furniture. You must find a furniture piece that will provide you with maximum benefit and utility. If you're spending huge amount on its purchase and maintenance, then make sure it retains its function. Otherwise, no matter how good the furniture looks in your home or office, it is of no use if it cannot provide any comfort. 4. Price: If you are lucky enough you may bag a good deal and get a vintage furniture at half the price as well. However, in normal circumstances where everything goes well, buying a vintage furniture can even cost you a fortune. Just make sure that whatever you may purchase should be worth each penny you have spent on it. Good tips there on what to look out for when buying vintage furniture. I think it's also advisable not to over do it. A few pieces dotted around a room really works but too many vintage pieces can be over kill.